I checked, and I've never reviewed a Donna Jo Napoli book here on the blog. This is a little (read: a lot!) unbelievable to me, because I devoured her fairy tale retellings when I first started reading young adult fiction (back in the last millennium). I remember her Little Mermaid and Rapunzel retellings in particular, and I can definitely attribute my continued passion for the subgenre to those early reads. When I got my weekly Edelweiss* email and saw Napoli's name in conjunction with fairy tale, I knew I had to put this one on the to-read list posthaste. 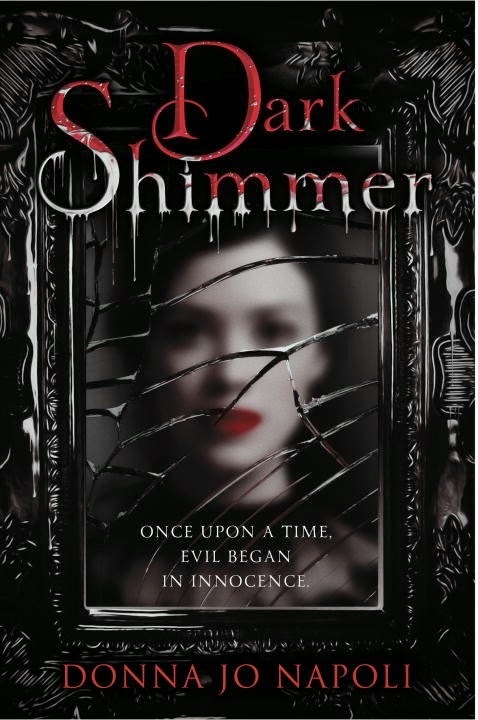 Dark Shimmer will be released on September 8, 2015 by Wendy Lamb Books (Penguin Random House). Set in medieval Venice, this captivating fairy tale retelling by award-winning author Donna Jo Napoli explores belonging, beauty, and the transformative power of love through the eyes of a teenage girl. Dolce has grown up hidden away on an island in a lagoon. She is a giant, a freak, tormented by everyone but her loving mother. She spends her time learning the valuable secret of making mirrors. Following a tragedy, Dolce swims away and lands on an island where people see her as normal, even beautiful. Marin, a kind widower, and his little daughter bring Dolce to live with them in their grand palazzo. Eventually, Dolce and Marin marry. She secretly continues to make mirrors, not realizing that quicksilver endangers her…and so evil begins in innocence. *If you don't already subscribe to/have an account with Edelweiss, I recommend it. Great place to peruse publishers' catalogs, check out upcoming books, and request early review copies (if that's something you'd be interested in). Napoli is like, the queen of retellings so I can absolutely understand wanting to get your hands on this. Great pick!! This one is new to me, but it looks really really good. I've been on a retellings kick lately so I'll have to add this one to my TBR list! SO I just went over to edelweiss and clicked on this one. Oh man, I used to read all the Donna Jo Napoli books. I think I reviewed her recent contemporary, but that's it.